On Monday, January 15 we celebrate Martin Luther King Jr. Day, which happens to fall on Dr. King’s birthday this year. 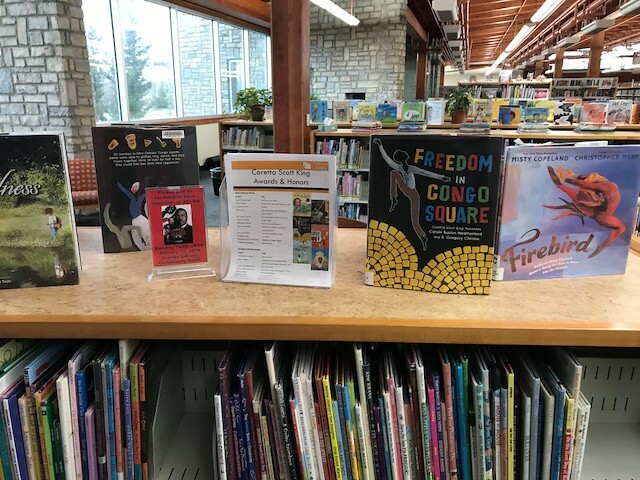 While all Delaware County District Library locations will operate on our regular business hours on Monday, each branch has come up with several very special ways to pay tribute to Dr. King and his hand in leading the Civil Rights Movement. At the Delaware Main Library, children will be able to express the dreams they would like to see happen for themselves, their families and their communities through crafts and writing projects. On display will be books on Dr. King, community helpers and making a difference. Additionally, children who stop by will have an opportunity to create a dream cloud mobile, or color and sign a large “DREAM” banner. The Powell Branch Library is using the day to create a Community Freedom Mural that will remain on display at the branch through February. Each participant will be given a colorful piece of paper to write down their thoughts, emotions, or pictures that represent what freedom is. These pieces will be placed on a wall in the library as a community symbol of freedom to celebrate Dr. King, with a goal to fill the library with color and open dialogue of what freedom means to so many people. Bookworms Book Club for ages 8-12 at the Orange Branch Library will have a special meeting on Monday, January 15 at 2 p.m. On this day, they’ll discuss the title “The Watsons go to Birmingham, 1963” by Christopher Paul Curtis. The book tells the story of the ordinary interactions and everyday routines of the Watsons, an African American family living in Flint, Michigan, until they are drastically changed after a visit to Grandma in Alabama in the summer of 1963. I hope you’ll take the time to stop by our branches on Monday and either participate in one of the day-long programs, or check out a book from one of the displays. Here are some titles for the holiday that I would recommend. “Just Mercy” by Bryan Stevenson. The founder of the Equal Justice Initiative in Montgomery, Alabama recounts his experiences as a lawyer working to assist those desperately in need, reflecting on his pursuit of the ideal of compassion in American justice. “Between the World and Me” by Ta-Nehisi Coates. Told through the author's own evolving understanding of the subject over the course of his life comes a bold and personal investigation into America's racial history and its contemporary echoes. “Freedom’s Daughters” by Lynne Olson. Profiles the fearless, resourceful female leaders of the civil rights movement, including Ida Wells, who led the protest against lynching, and Jo Ann Robinson, who helped launch the Montgomery bus boycott. “Carry Me Home” by Diane McWhorter. A journalist chronicles the peak of the civil rights movement, focusing on the African American freedom fighters who stood firm on issues of civil rights and segregation during the movement's eventful climax in Birmingham. "Gone Crazy in Alabama" by Rita Williams-Garcia. Spending the summer with their grandmother in the rural South, three sisters from Brooklyn discover the surprising reason behind their mother's estrangement from their aunt. "Birmingham Sunday" by Larry Dane Brimner. Describes the bombing of the Sixteenth Street Baptist Church in 1963 by Ku Klux Klan members, which killed four girls and sparked race riots in Birmingham, and discusses how the event contributed to the civil rights movement. "Revolution" by Deborah Wiles. Struggling to adapt within her newly blended family in 1964 Mississippi, young Sunny witnesses increasingly scary community agitation when activists from the North arrive in town to help register African Americans to vote. "As Brave As You" by Jason Reynolds. When Genie and his older brother spend their summer in the country with their grandparents, he learns a secret about his grandfather and what it means to be brave.